Dymock in one of nine parishes that make up the United Benefice of the Leadon Vale in the Anglican Diocese of Gloucester, part of the Church of England. 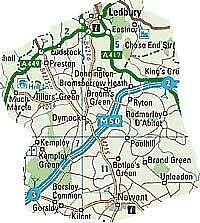 The others are: Donnington, Kempley, Preston, Redmarley, Upleadon, Bromesberrow, Oxenhall and Pauntley. Dymock's church building is mainly Norman. St Mary's Church, The Village, Dymock, Gloucestershire. GL18 2AQ. You'll find us on the B4215 road, about 3 miles west of the town of Newent and 12 miles north-west of the City of Gloucester.